Endemol have a rich history of developing online slot machines based on TV-shows and now they have brought Countdown to the reels. Countdown is one of the longest running game shows in the world, first hitting our screens in November 1982 and has remained a fixture of our screens on Channel 4 every weekday. 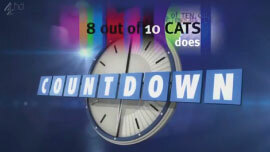 I’m sure you need no introduction to Countdown but if you’re unfamiliar with the show it sees contestants randomly pick vowels and consonants before trying to make the longest word possible, along with a numbers game where they have to perform calculations using specified numbers to get to a specific value, plus there is a conundrum at the end which has 9 letters and the contestant who buzzes with the correct answer first wins additional points. This slot was released by Endemol in 2010 and is more generic than usual thus nobody from the show features such as Nick Hewer, Rachel Riley or Susie Dent, however it is a very enjoyable with original sounds used – and most importantly it offers lots of winning opportunities. I found it pretty disappointing that none of the people from the show feature as symbols on the reels, and while I understand this was probably on purpose to prevent the slot becoming outdated when new people take over, I think including past faces would have added to the appeal for fans of the show – especially Richard Whitely who this could have been a fantastic tribute to. The main symbol to watch out for is the Countdown logo which acts Wild and therefore substitutes for all other symbols except for the Scatter’s, with any wins the Wild is part of being doubled. Rather than one Scatter (like how online slots usually work) there are actually three Scatter’s in Countdown which activate bonus features – the Numbers Board, host at the Letters Board, along with Pencil and Paper. All of these are joined by the trophy for the series winner, a clock, the famous countdown timer, dictionary, and A, K, Q, and J letters designed just as they appear on the cards of the show. Being a bit of a maths geek, the numbers game is definitely my favourite part of Countdown – and with lots of free spins with multipliers attached I think the Numbers bonus feature will become yours too! Firstly to activate this feature you need to land three or more Number Scatter symbols anywhere on the reels and this sees the famous numbers board from the TV show display on screen. You need to select 6 of the cards available (or use the autopick button) which are then added up to reveal your total number of free spins and your multiplier bonus is the value of the final card you select. I found this feature to be extremely rewarding, managing to acquire 14 free spins with a 3x multiplier that resulted in £107.50 win from a £2 stake. Three or more Pencil and Paper Scatter symbols anywhere triggers the conundrum bonus feature which every countdown show culminates with. This sees the word countdown shown in a panel with the letters O and U missing from it. You are then presented with a wheel which provides you with five opportunities to land the missing letters, with the number of letters you collect correlating with the value of the prize awarded. The Letters bonus feature begins when you land three or more Letters Scatter symbols anywhere on the reels and sees two contestants face off against each other to make the longest word from a set of letters – with the red player representing you. Just as happens in the show, a set of letters displays and the countdown music begins as the contestants franticly try to come up with the longest word – and you can play along too. Clicking the reveal button displays the word both players came up with and if the red player wins you get a cash prize, with five rounds played in total – get your dictionary at the ready! While appearing ‘geeky’ to many people, I’ve always enjoyed watching Countdown and can honestly say that Endemol have done a fantastic job recreating the show across 5 reels. Being a licensed slot they have been able to include the original sounds from the show such as the intro music and the clock ticking down, however I was a little disappointed that no people from the shows history were used – particularly Carol Vorderman who is always great to look at! The three bonus features are very rewarding and all based on the three main parts of the show – the letters game, numbers game and conundrum which give you a real taste of the game show – and big rewards!